Snippets of Jack: "I Can't Swim"
Murtogg: "This dock is off-limits to civilians." Jack: "I'm terribly sorry, I didn't know. If I see one, I shall inform you immediately. Apparently there's some sort of high-toned and fancy to-do up at the fort, eh? How could it be that two upstanding gentlemen, such as yourselves, did not merit an invitation?" Murtogg: "Someone's got to make sure that this dock stays off-limits to civilians." Jack: "It's a fine goal, to be sure. But it seems to me... that a ship like that one, makes this one here seem a bit superfluous, really." Murtogg: "Oh, the Dauntless is the power in these waters, true enough. But there's no ship as can match the Interceptor for speed." Jack: "I've heard of one, supposed to be very fast, nigh uncatchable: The Black Pearl." Mullroy: "Well, there's no real ship as can match the Interceptor." Murtogg: "The Black Pearl is a real ship." Murtogg: "Yes it is, I've seen it. " Mullroy: "You haven't seen it." Mullroy: "You've seen a ship with black sails that's crewed by the damned, and captained by a man so evil that Hell itself spat him back out?" Murtogg: "But I have seen a ship with black sails." Mullroy: "Oh, and no ship that's not crewed by the damned and captained by a man so evil that Hell itself spat him back out could possibly have black sails, therefore couldn't possibly be any other ship than the Black Pearl. Is that what you're telling me?" Murtogg and Mullroy are members of the British Royal Navy under Commodore James Norrington. I'm not sure who on earth would want these idiots working for them, but they are a good source of entertainment. Jack sparrow, seems to get the best of their dispute about the best ship, as he sneaks by them unoticed. Jack does have a way with tricking people and they do have a way with being stupid. I'm also really confused on why Mullroy is a marine when he admits to not being able to swim... Jack Sparrow: "Will you be saving her then?" Mullroy: "I can't swim." Jack Sparrow: "Pride of the King's navy you are. Do not lose these." They are for some reason trusted with important jobs, such as guarding the hearts of Davy Jones, keeping patrol of the harbor, and fighting in the final scene of the first movie. Murtogg: "What are we doing here?" Mullroy: "The pirates come out, unprepared and unawares. We catch 'em in a crossfire... send 'em down to see Old Hob." Murtogg: "I know *why* we're here. I mean, why aren't we doin' what - what Mr. Sparrow said? With the cannons and all?" 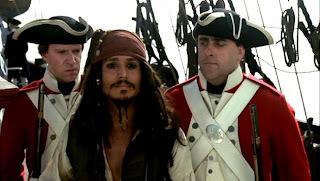 Norrington: "Because it was Mr. Sparrow who said it." Murtogg: "You don't think 'e was tellin' the truth?"